Everyone is born with an appendix. They might be pretty much useless to us now, but back in the mists of time they were essential for our survival. Nowadays, we tend not to notice them unless they get inflamed and cause problems. Sugar chemistry, being one of the oldest branches of organic chemistry, has many conventions that – like the appendix – were essential back in the day, but now have fallen out of general use. Similarly, inflammation is not uncommon in students who are learning these conventions – but alas, appendectomy is not an option here: the terms have to be learned. Thankfully learning the Fischer projection and the D/L convention is not *that* hard. Here’s some tips. The Fischer Projection is generally only applied to sugars and amino acids, but it can be useful in keeping the relationships between these different isomers straight. Here’s how it works. A sugar (such as glucose or galactose) is aligned in north-south fashion on a page, so that the most oxidized group (often an aldehyde, or ketone) is preferentially facing “north” on the page. Next, the carbons of the chain are rotated such that all of the groups branching off east-west point “out” of the page. Finally, the “dashes” and “wedges” are “flattened” so that it appears that there are no stereocenters. So even though the molecule is drawn “flat” it’s important to remember that it’s not. Back in the day my instructor gave me the helpful advice that it’s important to remember that “the arms come out to hug you”. After telling some students about this, one of them modified it to replace “hug” with “strangle”. I guess which convention you use depends on your relationship with sugars. you can rotate a Fischer projection 180° in the plane of the page. That is OK.
you can also do “bond rotations” with a Fischer projection. To do this, interconvert 3 groups on a given carbon in such a way to rotate it “clockwise” or counterclockwise”. never interconvert two groups! this is not allowed because it represents inverting the stereocenter. Essentially, this is a “single swap” on the carbon. Emil Fischer is also responsible for the terms “L” and “D“. This is an old, largely obsolete nomenclature, but it survives in the organic chemistry literature today. Using the Fischer projections to determine whether a sugar is L or D is fairly straightforward. Make sure the sugar is lined up properly (most oxidized group facing “north” on the page). Then look at the final (“southernmost”) stereocenter. Is the OH pointing right or left? 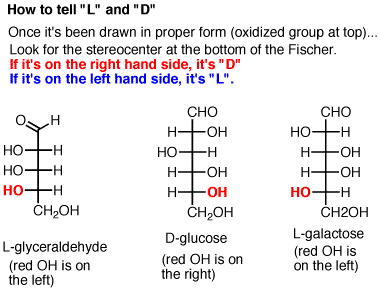 If it’s pointing right, it’s D. If it’s pointing left, it’s L. (The convention also works for amino acids – in that case, look for which way the nitrogen is pointing).